7-Day Detach N' Go Pill Organizer by Carex is the perfect pill organizer for individuals who are on a daily medication regimen. The 7-Day Detach N' Go Pill Organizer features seven interlocking, detachable compartments, individually labeled Sunday through Saturday. 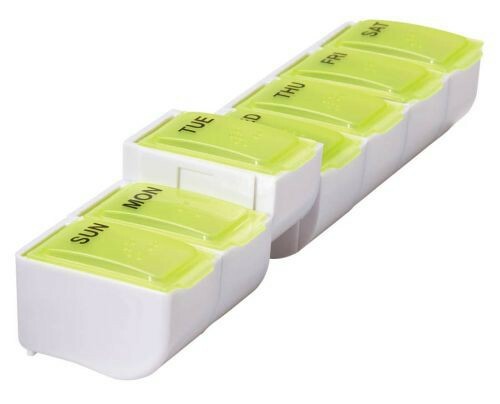 The individual self-contained single-day pill boxes can be kept all in one sequential piece, as well as detached to be conveniently taken on-the-go. The snap-on lids seal tightly so that medication is kept secure. 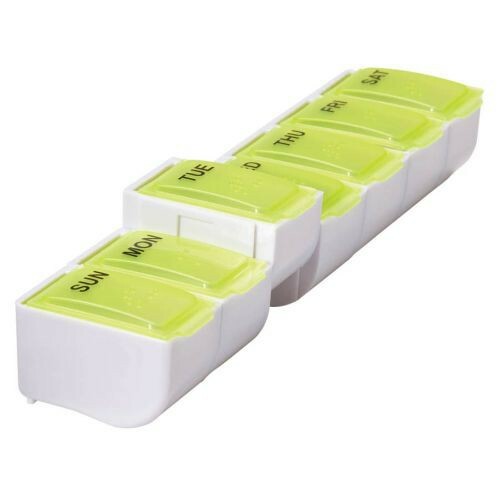 Each compartment of the 7-Day Detach N' Go Pill Organizer holds 25 aspirin-sized pills, while the contoured compartments ensure easy pill removal. The 7-Day Detach N' Go Pill Organizer is an excellent way to keep your pills organized and have them with you wherever you go. Vitality Medical also carries other Pill Organizers and Calendars, such as the Weekly Pill Organizer. Each Section Is a Self-Contained Single Day Pill Box. Each Compartment Holds 25 Aspirin-Sized Pills. Contoured Compartments For Easy Pill Removal.